Before you start reading my blog this week, you should understand one thing. I am smarter than you are, stronger than you are, faster than you are, more disciplined than you are, more educated than you are, wealthier than you are and healthier than you are. Paradoxically, I am also more humble than you are, more loving than you are, more compassionate than you are, have more friends than you, am better liked than you and have more love for others than you. Believe me; it is truly hard to be humble when I am SOOOOO superior to you. If you can stop gagging, you will notice in the first paragraph that my superiorities have to do with having more worldly or physical things than you. In the second paragraph, I allude to having more of the virtuous or spiritual things than you. Putting things and virtues together is the paradox. Can I really be more of everything than you are as well as being more humble, more loving and more compassionate? What is wrong with this idea? Look closely, and you will notice the problem. It is not wealth or health or things and it is not spiritual gifts. The problem is “More.” We want more and more and more. It does not matter whether it is more health or more compassion. More for the sake of more becomes our guiding principle. When I have “More” than you, I am better than you. Culturally, spiritually, or physically, I measure myself by the “more” I have than others have. I have arrived when I have more. More money, more clothes, more compassion, more humility becomes our goal in life. When do we have enough? In this blog and my next two blogs, I want to look at three areas where “more” causes or leads to substantial problems for us. I refer to our quest for “more” in each of these areas as an evil of arrogance. The three arrogancies that lead to disasters for us are: Cultural Arrogance, Religious Arrogance and Educational Arrogance. In my blog this week, I would like to address the subject of Cultural Arrogance. Next week, I will address Religious Arrogance and the following week the subject of Educational Arrogance. 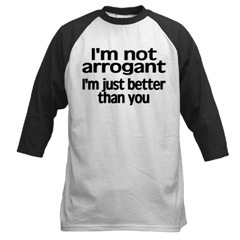 Let’s start by defining the term arrogance. Thus, Cultural Arrogance would imply that one believes or acts as though their culture was better than another culture. E.g. Americans are better than Europeans or Japanese are superior to Chinese. Here in the USA, we tend to believe that the “American Way of Life” is superior to other ways of pursuing our stated goals of life, liberty and the pursuit of happiness. We often act as though Americans only included people from the fifty states. It would surprise many Americans to know that Mexicans and Canadians and most indigenous people also live in America. In fact, unless we distinguish North America from South America and Central America, we must also include people from about 22 other countries as Americans. Time for a caveat! The Cultural Arrogance of the USA may impact the peace and stability of the entire world. My goal in sharing the negative issues that arise from this arrogance lies in the simple fact that all change starts with awareness. Awareness precedes choice, choice precedes action and action precedes change. Unless, we are aware of the attitudes, prejudices, biases and sometime simple minded assumptions we make about other countries and other cultures, we are doomed to keep making major strategic and tactical mistakes when it comes to dealing politically and also militarily with other nations. Two examples will illustrate the negative impacts of Cultural Arrogance. The second example is much more serious and concerns the Vietnam War. This war was an unmitigated disaster for both the people in the USA and the people in Vietnam. Part of our premise for the war was that the Vietnamese would go Communist and ally themselves with the Chinese to take over all of Southeast Asia. The concept of the “domino effect” was endlessly repeated as a justification for this totally unjustified war. A few years ago, I watched the documentary “The Fog of War” which was based on a series of interviews with Robert McNamara. He was Secretary of Defense under Kennedy and Johnson and one of the leading architects of our Vietnamese war strategy. McNamara was one of the “Brain Trust” that Kennedy appointed to his cabinet based on their accepted intellectual and cognitive abilities. McNamara was over 80 years old when the “Fog of War” was produced and his comments are made with both the wisdom of age and the advantage of hindsight. His conclusion was that the war was a total fiasco. The question which McNamara still could not seem to answer was “Why?” However, the answer was forthcoming. During McNamara’s meeting with his counterpart in Vietnam, General Vo Nguyen Giap; Giap asked McNamara if he had ever read any Vietnamese History. McNamara asked why? To which, Giap replied that if he had, he would have understood that the Vietnamese hated the Chinese and given their history, there is no way they would have allied with the Chinese. The Communist movement in Vietnam was a national movement for independence and not a movement to dominate Southeast Asia. Our lack of understanding of the Vietnamese culture led to numerous mistakes in policy and war strategy. My first professional exposure to the Cultural Arrogance endemic in the USA was in 1981. I was attending a speech by Dr. Robert Cole at the University of Minnesota sponsored by the Minnesota Society for Training and Development. Dr. Cole was talking about the Japanese quality effort. Dr. Cole spent seven years studying blue collar workers in Japan and is the author of numerous books on quality and productivity. Dr. Cole noted that every major trade, scientific and technical journal published in the USA was reprinted in Japan in Japanese. He asked how many Japanese trade and technical and scientific journals did we think were reprinted in English and available in the USA? The answer was ZERO! That’s right! Not one Japanese article was reprinted in the USA. Remember, this was 1981 before most Americans realized that the Japanese were already producing higher quality products in many areas then we were in the USA. We have been working for 30 years now to catch up but the arrogance that led to our export problems has still not abated. In 1971, I was in a grocery store in Racine, Wisconsin with a Mexican American friend. We were waiting in the checkout line and when we finally were being rung up; the cashier said to my friend “Oh, I see you are a Puerto Rican.” My friend simply replied: “No, I am Mexican American” to which the cashier replied “Oh well, Mexican, Puerto Rican, it’s all the same.” Too many people in the USA still assume that “it’s all the same.” The only measurement that counts is the standards we use in the USA. Thus, our jury system is better than others, our government system is better than others, our constitution is better than others, our economic system is better than others, our workers are better than others, our culture is better than others. These attributes are the heart of arrogance. We go into Iraq and Afghanistan and because our democracy is “better than their systems” we are going to stay there until we see that the primitive Arabs are now voting regularly and have all the same benefits we do of a fair and impartial election system. Ignored are the thousands of lobbyists working daily in the USA to subvert our democratic system or the hundreds of examples of cronyism, nepotism, greed and corruption that plague our political system. Made in America trumps made in any country in the world except when it comes time to buy products and services as cheaply as we can. We snap up the latest bargains regardless of where they are made in the world. We used to say “Jap Crap” but we cannot use such phrases anymore since we are now importing low cost high quality products from over one hundred countries in the world. We probably don’t have enough slang terms to scorn all the countries we buy from: Polacks, Japs, Gooks, Slopes, Commies, Frogs, Limeys, Dago’s, that’s about all I can think of. Only 90 more to go and I can denigrate the entire world import economy. How do we overcome Cultural Arrogance? This is a question that should concern each and every person in this country. It is one thing to be proud of your country. I have often stated that having visited 33 other countries, I have not found another nation I would want to live in. I am proud of my country and proud of my heritage. However, remember the admonition: “Pride goeth before a fall.” Hubris has been the downfall of many great leaders and it can be the downfall of a country. Depp is a highly popular movie star. He is known throughout the world and his movies are viewed by millions. He has become somewhat of an icon with his wild portrayals of pirates, Native Americans, vampires, and other interesting characters that many main stream actors would not attempt to portray. He is a brilliant actor but that does not mean his views are right or that I agree with them. I used his quote to point out that not everyone thinks the USA has the world’s greatest culture. Ayn Rand is one of the foundational thinkers of the new conservatives in the USA. A popular intellectual and proponent of individualistic ethics, she has been outspoken in her criticism of big government and centralized government planning. It is interesting that many of her followers would probably not realize that she was disgusted with Western ethics and had a strong belief in the need for culture change. Cesar Chavez was an American “Gandhi.” “Chavez became the best known Latino American civil rights activist, and was strongly supported by the mainstream American labor movement. His public-relations approach to unionism and aggressive but nonviolent tactics made the farm workers’ struggle a moral cause with nationwide support.” (Wikipedia) Chavez pursued the idea of respect for others in his strategies to help migrant workers and numerous farm workers achieve decent benefits and wages. He did not see the need to denigrate other cultures in his efforts to win respect for the predominantly “Latino” farm workers culture. Do we have to put other cultures down to elevate our own? Do we respect other cultures when we assume they all want to be “democratic” or capitalistic? How can we elect politicians who will respect the diversity of nations and other cultures? Do you teach your children respect for other cultures? Do you show respect for other cultures in your daily activities? Do you think living in the USA makes you superior to other people? Previous Tell me about the “Good Ole Days” Next Religious Arrogance: Will the Meek Really Inherit the Earth? thing. Do you have any points for beginner blog writers? Feel free to email me and we can talk. Or SKype me sometime. Definitely consider that which you said. Your favourite justification seemed to be on the internet the simplest thing to bear in mind of. time as other people think about worries that they just do not understand about. for the reason that this this web page conations truly nice funny material too. to mine. Please blast me an email if interested. Thanks! out from Atascocita Texas! Just wanted to say keep up the fantastic work! Hi there to every one, for the reason that I am really keen of reading this web site’s post to be updated regularly. It’ѕ awesome designed for me to have a web site, which is helpful in support of my experience. Hi Christian, Thanks for your reply. I would be happy to talk to you about blogging. GIve me a call at 612-310-3803. If I do not pick up, leave a message and I good time to get back to you. Too much to say about blogging for a quick email. a look for. You’ve ended my 4 day lengthy hunt! God Bless you man. Have a nice day. Thanks Rachel, my followers are legion. 🙂 Well, maybe about a few million less than legion. Thanks for the comments though. One person who enjoys and finds my thoughts useful is enough for me each day.